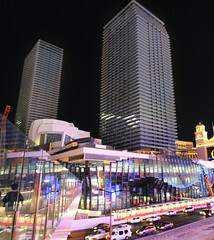 The Cosmopolitan is Las Vegas' newest grand hotel. They've just signed to be marketed by the Marriot corporation but the Cosmopolitan will certainly be in a class by itself as one of Las Vegas' most exclusive new properties. The Cosmopolitan will offer upscale, classy rooms with a very "chic" feel to the property. They'll offer gaming "cabanas" along with a beautiful new set of pools and desert motifs. Located in the CityCenter Complex between the Bellagio and Aria Las Vegas.